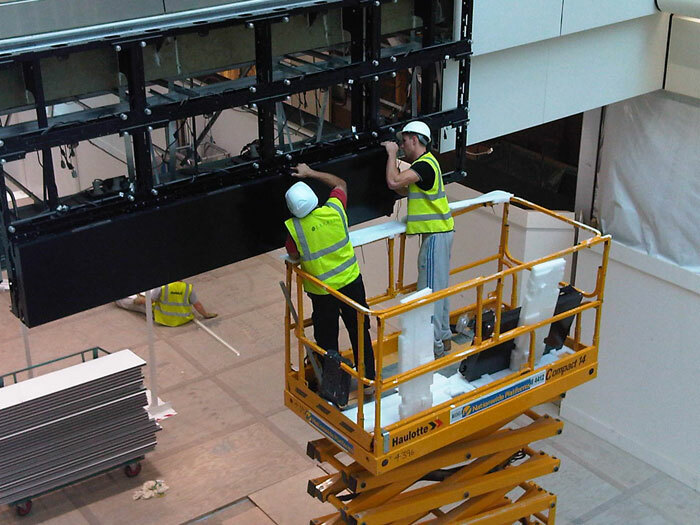 Westfield drove the desire for these digital screens and commissioned Esprit Digital (Herts, England) to facilitate the delivery at the new shopping centre. The Westfield - Stratford City which is owned by the Westfield Group and is rated as the third largest shopping centre in United Kingdom with approximately 1,883,700 square feet (175,00 m2) of tenant space. Since opening in September, 2011, attendance within the mall has been running with an estimated 13.6 million customers in its first 14 weeks which averages out to 900,000 customers a week. As a leading London mall, Stratford City hosts over 275 businesses including two anchor tenants, Marks & Spencer and John Lewis, plus Vue Cinema (a movie theater complex), All Star lanes bowling and Aspers Casino. Its supporting cast included a cornucopia of retail tenants including department stores, jewelry, home and beauty goods, a pharmacy and even two super markets. Between Westfield - Stratford City's enormous size and unique location, the mall is also at the crossroads of much of London's cultural, retail and fashion activities. The shopping centre is located in close proximity to the new London Olympic Park, site of the 2012 Olympic Summer Games which will host summer sports of cycling, swimming, diving, track & field and gymnastics. It is estimated that 70% of all Olympic Games attendees are expected to pass through the mall. Another tremendous addition to Westfield - Stratford City's daily attendance is that it is also located directly above Stratford London, the underground tube (subway) platform serving that part of the city. Between subway passengers, Olympic ticket holders, and mall shoppers, Westfield - Stratford City promises to be one busy mall during the summer of 2012. With this massive influx of public traffic constantly circulating throughout the mall, it was only natural for Westfield to incorporate a state-of-the-art digital signage media system to keep Westfield's customers connected to the mall and its on-site tenants. Furthermore with the Olympic Games happening literally next door to the mall, it is a great opportunity for Westfield - Stratford City to use their digital signage to compliment the competitions as they occur. One of many Wesifield - Stratford City video wall's which was mounted by a mall traffic hub opposite an escalator landing, allowing customers to have good viewing opportunities of watching the screens in passing. The overall Westfield Centre digital signage was presented in at least three layers: several outdoor LED displays, an interior third party digital advertising network sponsored by CBS Outdoor, and a massive interior digital sign system that will be discussed within this article. The John Lewis display complete and in its "testing" phase. With data and power connected, it was time to tune the display to maximum resolution and brightness. "The importance of digital signage at Westfield Centre-Stratford City was emphasized by Myf Ryan, General Manager of Marketing UK, Westfield, who noted, "The on-going inclusion of digital signage is now seen as a fundamental component of shopping centre operations and is vital in enhancing the shopper's customer experience by educating them on product offerings, brand awareness and reinforcing a positive shopping experience at the mall. The scale and scope of digital signage for customer messaging and content is as yet unmatched in other UK shopping centres." John Lewis, a leading UK department store, installed a massive video wall directly in front of their store. In completion, they presented a double-sided display with 102 screens (51 screens per side) which was, for now considered the largest LCD video wall in Europe. To gain this massive digital sign network, the Westfield Group commissioned Esprit Digital (Herts, U.K.), a full system integrator of digital signage systems to design, spec and install a state-of-the-art sign system within the Westfield - Stratford City designed to Westfield's specifications. Esprit (started in 2004) utilizes both LCD and LED displays as complete digital media systems for many public hubs including airport and train transit terminals, sport stadiums, concert halls, bus stops and shopping centres, and other 'captive audience' sites. Esprit designs, fabricates, installs and operates their digital sign systems throughout United Kingdom, Europe and soon, the United Sates. John Lewis screen in fabrication on-site with its digital sign fame under construction. 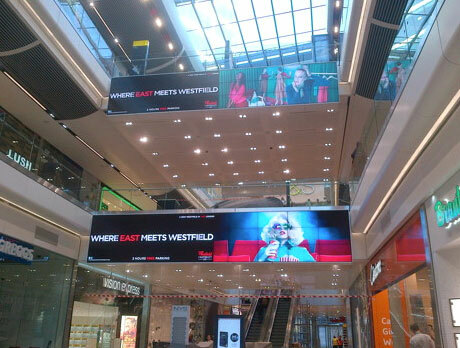 In regard to Westfield - Stratford City, it was obvious notes Esprit Managing Director, Peter Livesey, "that in working inside of one of the largest shopping malls in Europe, Westfield wanted, and we recommended, digital displays of equal scale to provide maximum viewing opportunities and relevant Westfield media content for their audiences. As well, there was also the issue of where to place these display screens in terms of accessible audience through points within the mall." In this one instance at Westfield - Stratford City, two video walls were mounted, one above the other, on the side wall of each floor opening. "To meet these objectives, we created several types of digital displays from single screen modules to massive video wall set ups that in some cases, occupied the entire length of a mall wall. These video screens were either located in front of an anchor tenant's store or by a mall traffic hub such as near an escalator landing, allowing customers passing by to have good viewing opportunities of the various digital displays." The basic Westfield - Stratford City display workhorse digital screen is the Samsung 46OUT-2, which is a 46-inch diagonal LCD display with a resolution of 1366 x 768 pixels and an eight-bit color display capable of 16.7 million color output. The unit also has a contrast ration of 3000:1 and a 178 degree (both horizontal and vertical) viewing angle. The Mini Wafers where single screen displays were carefully posititoned near mall crosswalks for ease of viewing while moving about the mall. 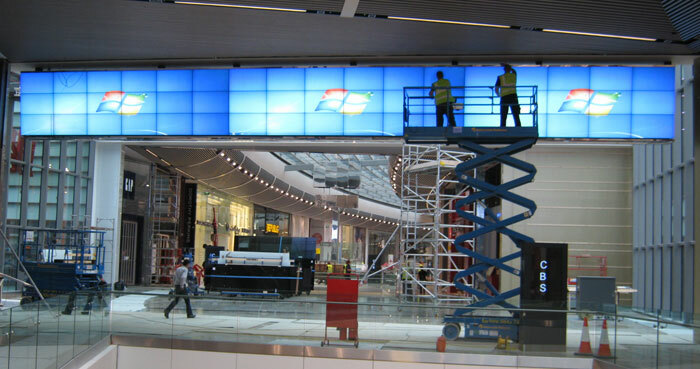 The Samsung display was used both as a standalone screen and as a tiling component to build the various video walls deployed around Westfield - Stratford City. The Samsung module was selected for its ultra narrow bezel which offered as little side-by-side seam separation as possible and is an important feature when multiple displays are tiled together and built up into a video wall. The video wall design is very scalable, and in planning the various video walls, depending on location, a certain sized video wall was recommended for that site. 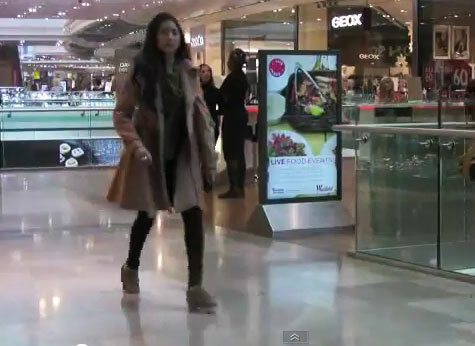 In all, at least 16 video walls were recommended and installed throughout the Westfield - Stratford City. Sony's Ziris Canvas digital cinema installed at their flagship movie complex at Westfield Startford City. 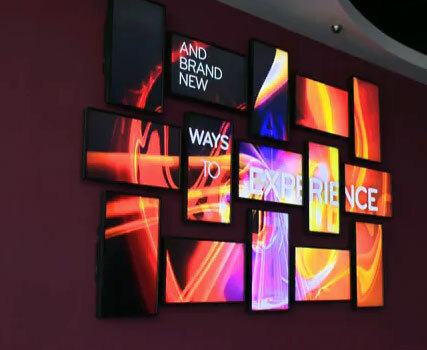 Wall mounted digital display present an unusual configuration as a cinema lobby presentation. "Once a wall location was determined, and the video size sorted out, we used the Samsung 46" LCD as a basic building block (with the appropriate number of Samsung screens) to create that particular video wall. To begin a video wall installation, we started with the metal work," noted Livesey, "creating a fully formed steel frame that first went up. That structure once finalized looked like a honeycomb nest. Once completed, each honeycomb cell was populated with a Samsung LCD. Each module was contiguously connected to the next LCD screen. As the various screens were installed, they were wired together with data and power lines and tested. Once all the screens were in place, we then fit the perimeter cladding around the screens, and with that finishing touch, we had another new video wall." (10) 12 screen (2 high - 6 across) video walls, each placed above one of the main concourses. (2) 27 (3 high and 9 across) screen video walls, one located above the other and installed next to anchor tenant Marks & Spencer, a British retailer of luxury food and fashion. (1) (3 high x 17 across per side) the centerpiece mall video wall, a double-sided display with 102 screens (51 screens per side) was installed outside of John Lewis, a leading UK department store. This display, for now is considered the largest LCD video wall in Europe. (18) free-standing double-sided vertical Samsung (55" display) LCD screens known as a "Mini Wafer." These screens were deployed along mall walkways inside and outside the shopping mall. 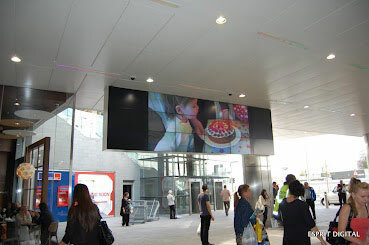 (4) Wall-mounted Samsung (55" display) LCD screens placed within Westfield - Stratford City. (1) One tenant, Vue Cinema acquired a 5 x 5 LCD video display for theater cinema lobby as a promotion platform for upcoming movies and concession sales specials. Each video wall had its own media player and all media players were managed by a Scala Content Manager that uploaded that video wall's unique content to its specific video wall and then displayed the content as scheduled. Once the Westfield digital signage went live, Esprit initially managed its operation for several months while they also trained an on-site staff to eventually take over its day-to-day operation. In turn, Westfield's in-house creative team also managed most of the mall's sign content as they either created it or in some cases acquired it from the brand's creative agency and then incorporated it into their various digital sign systems. 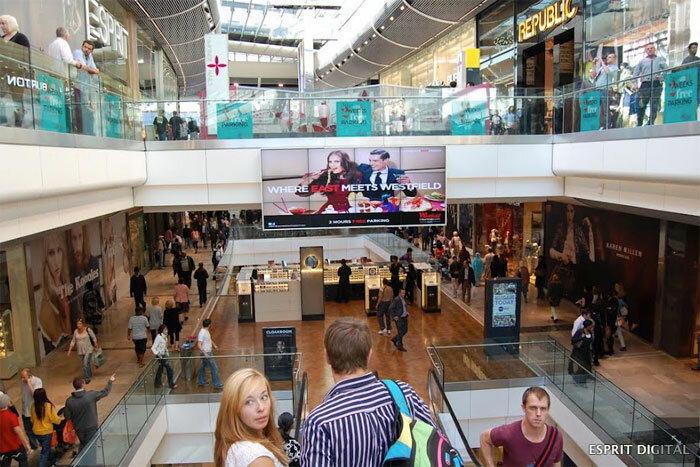 "With the Westfield - Stratford City digital sign system operational," Ryan noted, "Our retail tenants absolutely loved their access to the digital screens and used the system to advertise their product which helped to increase their store traffic and drive sales. " A ceiling-hung video display (6 by 3 screens) mounted directly in front of the mall entrance. 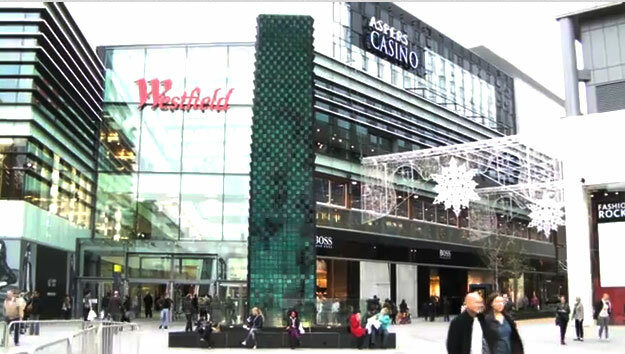 Livesey also emphasized that Esprit is able to do remote real time maintenance on Westfield's digital signage from their home office in North London. If a component of that digital sign system goes down, Esprit would know about it pretty quickly and have a crew on it as soon as possible. As for Westfield - Stratford City's various types of display content, it depends on which screens are viewed as each type of screen offered very specialized content segments. Overall, Westfield - Stratford City presented a broad spectrum of media coverage where typical video wall content was divided with approximately 80% of its presentations given over to Westfield brand partners and major anchor tenants and the remaining 20% used by Westfield for its in-house event promotions, which included according to Ryan, "editorial content on fashion, food, health-aids and entertainment as applicable to the Westfield shopping experience. The benefit of having a digital network of screens at our disposal has enabled us to change messages throughout the day as well as across the week to respond to the changing customer profiles as well as more general seasonality." There were also screens dedicated to way finding, and in certain instances news tickers racing across the bottom of those screens with up-to-the minute new alerts. The smaller LCD Mini Wafer displays were 100% dedicated to marketing, promoting Westfield in-house events such as off-hours discounts, parking rates, and upcoming fashion shows or cooking demonstrations as they occurred. In terms of creating appropriate customer engagement experiences, an immediate digital display opportunity will be some kind of coverage of the Olympic 2012 Summer Games. Once the Olympic Games have ended, Ryan noted, further digital display coverage may in the future include other live events such as music concerts, live entertainment, and other relevant presentations that would compel our customers to return to Westfield - Stratford City on a continual basis." In acknowledgement of its extensive fully integrated digital signage system, Westfield -Stratford City won an award from the Digital Signage Association in the category of Best Retail Deployment. As the importance of retail digital signage grows as the concierge of the customer experience it has become much valued as a new media enhancement to public and commercial common area space. Digital signages' measure of ROI (Return On Investment) is now seen in more than just money, as also offering brand loyalty and customer connectivity. For sure it is becoming the sweet spot of a modern shopping mall experience and when successful, giving shoppers an incentive to return to that mall for similar customer inspirations.